This popular 45 minute evening recital series continues with the second concert in the series: an evening of piano, violin and voice. The recital stars the outstanding local talent of guest Soprano Emily Curio (Soprano), Nadia Giliova (violin) and Elena Parker (piano). The evening features an uplifting mix of Bach, Vivaldi and Bourree and features Romantic piano solos through to Mozart arias. Award winning Russian born pianist Nadia Giliova has performed in many significant venues and festivals in London and across the country. These included highly successful solo performances at prestigious concert halls including the Wigmore Hall. Elena Parker was born in Russia and graduated as a violin teacher and performer in 1988 from the Music College of Cheboksary, Chuvash Republic, Russia. She has been teaching violin to children for more than 20 years and currently has a thriving Suzuki class at All Saints school in Fulham. Music By The Bridge brings together members of local community on the second Friday of each month to listen to a rich variety of musical performers from within the local area and beyond. Many of the musicians performing in the recital series are pursuing professional musical careers and Music by The Bridge offers a great opportunity to see and hear these local musicians as they embark on their very first concert tours. Musicians participating in the series are also supporting the development of the renowned music programme at All Saints church by performing free of charge. The programme allows choral scholars to train and perform under expert musical direction and for many the Friday Recital series offers valuable performing experience. Drinks will be available before the service and local restaurant Bloom are offering all those attending Music By The Bridge a discount on their evening main meal menu. Simply take your programme to Bloom after the concert. All are welcome and concerts are free. Nadia Giliova: Award winning Russian born pianist Nadia Giliova has performed in many significant venues and festivals in London and across the country. These included highly successful solo performances at Wigmore Hall, St John’s Smith Square, St Martin-in-the-Field, St. James’s Piccadilly, Pushkin House London, CBSO Birmingham, Master Musician Series in Newcastle, Brighton Festival, City of London Festival, Petworth Festival, Rachmaninov Festival Russia and the prestigious Steinway Piano Festival in the USA. 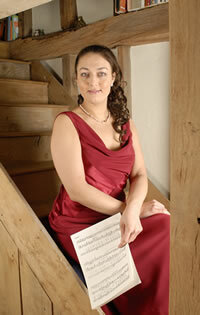 Nadia is a sought-after chamber musician and accompanist; she has collaborated with soloists of Novaya Opera Moscow, Norwegian Opera and Glyndebourne Festival Opera. She is a winner of several international piano competitions including the Prokofiev Competition in Russia and the Oxford Festival. She graduated with the highest distinction from the Gnessin Academy of Music in Moscow and the Royal Academy of Music, London. She is a keen supporter of many national and international charities and is frequently asked to perform in private fundraising events that have included a number at Windsor, recently in the presence of Her Majesty the Queen. Nadia teaches piano to pupils at All Saints School. Elena Parker: Elena was born in Russia and graduated as a violin teacher and performer in 1988 from the Music College of Cheboksary, Chuvash Republic, Russia. She has been teaching violin to children for more than 20 years and can teach both the traditional Russian school method and Suzuki method, often using elements of both. Elena has a thriving Suzuki class at All Saints School.